My wife wants me to consider soundproofing the wall just outside our main bedroom, to deflect the noises coming from the neighbor's dog. The dog is unusually loud - like gunshots... very fast and very loud. 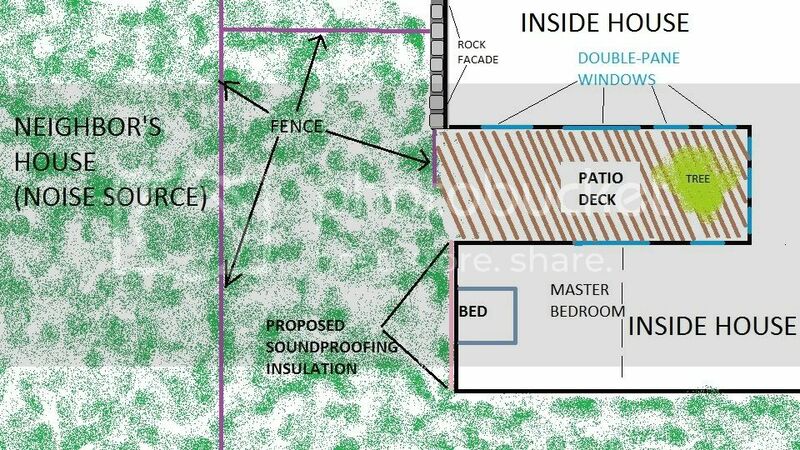 Though I believe in the effectiveness of soundproofing an exterior wall, I'm not sure how effective it would be since we have a large sliding glass door window on the adjacent wall facing the pocket into our U-shaped floor plan. See attached diagram. It seems like this pocket of bouncing sound all around might make the task a moot point. Would a soundproofing endeavor of our exterior bedroom wall be worth the effort, given this acoustic dynamic? Well, you'd need to do all 3 exterior walls to be effective. But you are right - even if you go overboard soundproofing the walls, a ton of sound will leak through the SGD. Through a normal spaced double-glazed window assembly, you're lucky to get an STC of 30. And the panes of glass are the same thickness, so you get a nasty resonance dip, making it seem like you have hardly any glass at all. Depending on elevation, distance to the home and height of the fence you might be able to add MLV to your fence and start the reduction process enough to where additional window/ wall treatment might be more effective in the end. Barking Dogs are actually a very difficult noise source to reduce and there is no such thing as over kill...it comes down to how much reduction is needed to make it tolerable..
John's right,you must treat all 3 walls and windows if your going to try and treat this from the inside alone. Your soundproof bubble is only as good as the weakest spot...always address windows first to determine the additional mass needed for the walls to make the bubble equal/cost effective. Guys... Thank you very much for your advice with this. You make it all work.